A Low Sodium (or Low Salt) Diet aims to reduce the daily intake of sodium or salt. The daily recommended intake of sodium is 2.4 grams (2,400 milligrams) per day. Most people in Western countries eat far more than this. This amount of sodium is equal to a teaspoon of table salt per day. The DASH diet is a popular implementation of a low-sodium diet. Many studies have found that a reduction of sodium can lead to a lower blood pressure. In fact, a level of 1,500 mg has been found to have the best affect on this with high blood pressure (or hypertension). Many foods contain ‘hidden’ quantities of sodium, so it pays to read the food label. It is a government requirement to list sodium quantities. Add less salt at the table and in cooking. Reduce the amount a little each day until none is used. Try spices and herbs instead. Cook with low-salt ingredients. 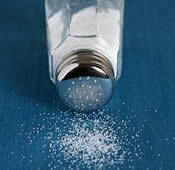 Remove salt from recipes whenever possible. Rice, pasta, and hot cereals can be cooked with little or no salt. Use fewer sauces, mixes, and “instant” products this includes flavored rices, pasta, and cereal, which usually have salt added. Rinse salt from canned foods. Limit smoked, cured, or processed beef, pork, or poultry. Look for low sodium recipes here. The low Sodium diet-Is it also good for diabetics?